Yesteryear lover boy R Madhavan of late is doing different genre films and roles. The actor who made his Telugu debut with Naga Chaitanya starrer Savyasachi is making his directorial debut with an upcoming film Rocketry: The Nambi Effect where he is playing the titular role of the ISRO scientist Narayanan Nambi. Maddy is undergoing extreme transformation to play the 75 years old scientist. The actor informs that it is as long as 14 hours process to match the look of Narayanan Nambi. “Who is who is who...#Rocketryfilm rocketryfilm. After 14 hrs on the chair.. Who is who is WHO?? ?” informs Madhavan. The resemblance indeed is pretty perfect. 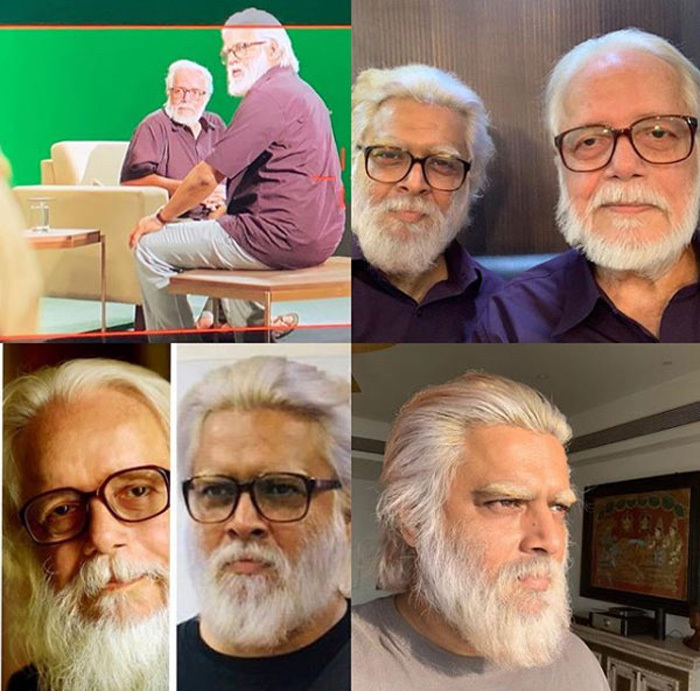 Madhavan calls it as one of the toughest roles he has played adding he took two years time to imbibe charm and charisma of Nambi and to learn walk like him. As a senior official at the Indian Space Research Organisation (ISRO), Narayanan was in-charge of the cryogenics division. In 1994, he was falsely charged with espionage and arrested. The charges against him were dismissed by the Central Bureau of Investigation (CBI) in 1996, and the Supreme Court declared him not guilty in 1998. Rocketry: The Nambi Effect is slated for release later this year.